Are you feeling sluggish from overindulgence during the festive season? Do you want to make changes to improve your health, but lack the motivation to do so, or just find it difficult to get started? Would you like to supercharge your health with a detox programme that doesn’t involve restrictive dieting or harsh and drastic measures? If so then I have a perfect solution to help cleanse and revitalise your system, increase your energy and help get you back on track at the pace your body can handle with your own Personalised 3 Week Homeopathy Detox Programme. Most of us will attempt to detox by “giving up” rich foods, cigarettes, chocolates and alcohol. We might also introduce more healthy organic foods and drink lots of purified water too. While this is a great start to a detox and is often enough to get some people back to feeling great, for many it will be insufficient in creating dramatic change due to an accumulation of toxins that the body is already unable to process. The blame does not all rest with the Christmas period of overindulgence, but is compounded with constant exposure to environmental pollution, food additives, processed foods, pesticides and medications which stress our body beyond its natural limits. 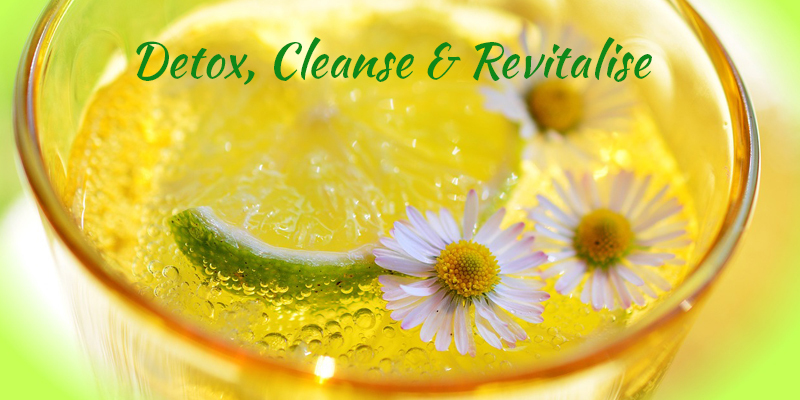 Our body has a powerful and sophisticated detoxification process that works to neutralize and excrete toxins. The organs involved in this process include the kidneys, liver, lungs, digestive and lymphatic system and the skin. If these organs and systems are overloaded and congested with toxins, the excess accumulation causes problems. Imagine a sluggish drain with an accumulation of sediment that stops it running freely. Think of the mess it creates as it blocks up. Detoxification means the process of removing toxic substances from the body and it takes place every day. Homeopathy offers an excellent support in detoxing as the remedies used stimulate the body’s own natural elimination and detoxing process in a deep and powerful way. In stimulating the cells to release the toxins the elimination organs can do their job more effectively, improving the overall vitality and energy as the body becomes free of toxins. In Homeopathy a detox programme is designed specific to your needs to help your body achieve an optimal detox. Rather than a typical off the shelf prescription of “one pill fits all” after an in depth consultation we prescribe according to your particular requirements. Improve the organ function and redress any areas of weakness. Encourage better digestion and absorption (less bloating and improved bowel function). Improve concentration and clearness of thoughts. Boost overall improvement of your immune function. All Remedies Included **(Homeopathic, (up to 15 remedies depending on programme used), Tissues Salts, Tinctures and Bach Flowers as required). Consultations can be done in person or online via Skype/Video Call. **Homeopathic remedies are supplied for Ireland and UK clients. Overseas clients will be given a prescription payable directly to a homeopathic pharmacy or local supplier. Details of where to buy your remedies will be provided. It’s so important to look at the foundations of your health and heal your body from the inside out. Your body needs a break, a chance to clear our the toxins and reset itself towards wellness. A detox isn’t a magic solution for all diseases but it is a positive first step towards better health. If you are ready to commit to getting your health back on track and feel great again, you can book a Free 15 Minute Consultation, call me on 0860891037 (International +353 860891037) or email me at eileen@homeopathy-healing.com to book your place today.